Coffs Harbour, New South Wales: Nuria Iturrios (pictured) from Spain holds a four-shot lead midway through the Pacific Bay Resort Australian Ladies Classic – Bonville after a superb second round of 67, played in strong winds and rain. Just nine players are in red figures for the tournament with Iturrios leading on eight-under-par in total. Overnight leader Doey Choi dropped to four-under and outright second with fellow Australian Hannah Green in third on three-under. Sweden’s Madelene Sagstrom, Jenny Haglund and rookie Linnea Strom share fourth with Norwegian Marianne Skarpnord. Those out early played through squally conditions with a fickle wind, which strengthened considerably for the afternoon wave. Iturrios’ 67 was the best round of the day and she was only one of two players to break 70 along with Denmark’s Nicole Broch Larsen (69), lying in a share of 10th. She has changed her swing over the winter to hit a lower shot, which helped her to control the ball in the wet and blustery conditions. “I made three or four birdies in that wind, so I’m feeling so great. I’ll just keep hitting those low balls,” she said. Green remains highly motivated to win on home soil for the first time and takes comfort from her ball striking in the conditions. 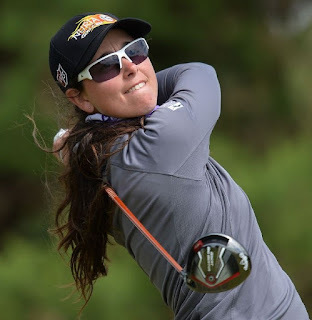 Strom, who is playing in her first Ladies European Tour event as a rookie professional, was tied for third with Green but bogeyed the last hole in fading light. Don’t miss the action from Bonville Golf Resort this weekend. The last group tees off at 9.20am with live coverage on television and live streaming online from 10.30am AEST. Although Maguire was raised in Cavan, she has spent the last four years at Duke University in North Carolina and said that she is not used to playing in such strong winds in general.